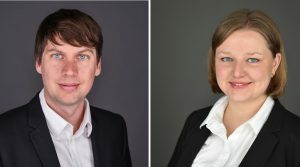 KCG Researchers Finn Ole Semrau and Frauke Steglich joined the 21st Göttingen Workshop “Internationale Wirtschaftsbeziehungen“,which took place on February 20-22 in Göttingen, Germany. Organized by Prof. Dr. Gerhard Rübel (University Göttingen) and Prof. Dr. Carsten Eckel (Ludwig-Maximilians-Universität München) in cooperation with the Center for European, Governance and Economic Development Research (cege), the workshop brought together German speaking junior and senior academics who specialize in theoretical and empirical international economics. Prof. Dr. Carsten Eckel gave the keynote speech of the workshop on “Too much of a good thing? Labour market imperfections as a source of exceptional exporter performance”. Finn Ole Semrau presented a paper titled “Stepping up to the mark? Firms’ export activity and environmental innovation in 14 European countries”, which is co-authored by Prof. Aoife Hanley, Ph.D. (KCG Senior Fellow). They investigate how a firm’s export activity and country idiosyncrasies determine the firm’s adoption of environmental innovation. In line with prior studies, they do not find any environmental premium to exporting, if a firm is from an advanced European country. Conversely, in a finding new to the literature, they reveal a positive relationship between exports and environmental innovation, if a firm is from a less advanced country. Additional results indicate that foreign stakeholder preference affects the environmental performance of domestic firms. Frauke Steglich presented an ongoing research project “Importing, exporting, and firm level volatility in India”, which is joint work with three other KCG (Senior) Fellows, Prof. Holger Görg, Ph.D., Thilo Kroeger, and Prof. Horst Raff Ph.D. This paper examines the relationship between firms’ trade status and their production and sales volatility using a detailed data set on firms’ balance sheets from an emerging market – India. Preliminary findings suggest that importers and exporters have lower volatility in both production and sales, as compared to their purely domestic counterparts. The direction of the effect is established by evaluating the short- and long-run changes in firms’ production and sales fluctuations for import and export starting firms. Additionally, an exogenous tariff reform imposed by the International Monetary Fund is exploited to tackle endogeneity concerns of the analysis.